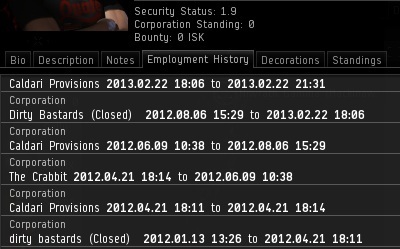 Out of nowhere, another corp declared war against me. As far as I could tell, the belligerent corp didn't have any association with Aliosis or his alt. With split-second timing, I performed a hair-raising maneuver. 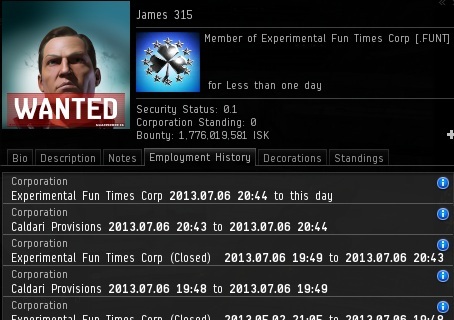 It was high risk, high reward: I won the war, and the Experimental Fun Times Corp rose like a phoenix from its ashes. 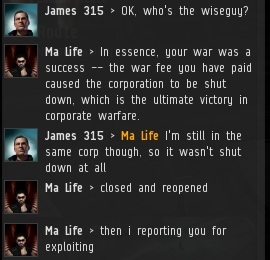 It was the eleventh war won--550 million hostile wardec fees down the drain. I demanded to know who was behind the latest act of aggression, but it only got me another petition threat from a random local. Things were heating up. It looked like another late night for the overworked GM staff. The New Order is good for Iceland's economy, though--they'll need to open up a new branch at CCP just to handle all of the New Order-related paperwork. 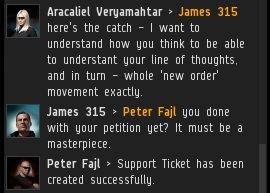 Out of nowhere, a gentleman named Peter Fajl appeared, vowing to get me expelled from the EVE galaxy for good. Peter was the CEO of Dirty Bastards, the corporation that Aliosis had gotten to wardec me in the first place. Judging by Peter and Aliosis' character portraits, they were one and the same. I couldn't help but notice that Dirty Bastards had closed and reopened its own doors a few times over the last year and a half. Carebear hypocrisy at its finest. At my urging, Peter went into a little more detail about the "exploit" that I had allegedly used. 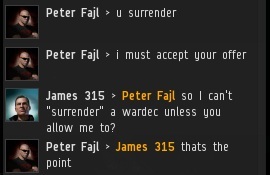 He couldn't understand how my corp had "surrendered" without his permission. I guess he didn't realize whom he was dealing with. 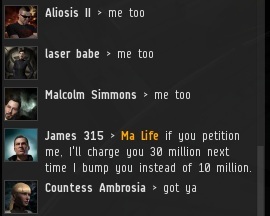 I'm the Saviour of Highsec. I don't ask for permission, I take what's mine. I invited Peter to a private convo so we could discuss our problems in a more casual setting, but he was a man on a mission. He immediately closed the chat and resumed work on his petition. Finally, Peter announced that he had completed the missive. 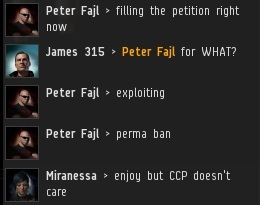 Now it was up to CCP. I've occasionally gotten good results by asking carebears to forward me a copy of their petitions, but Peter was like a rock. He wouldn't budge. Meanwhile, I tried talking to Aliosis directly, but we were no longer on speaking terms for some reason. It may have had something to do with a wardec that didn't go well for him, I don't know. After a long time, a lightbulb went off. He finally got it. For any aspiring Agents out there, this is the moral of the story: You may encounter a "problem" student who doesn't seem capable of learning. Don't you believe it. If you keep at it, eventually you'll achieve a breakthrough. Sometimes the slowest pupils can be the most rewarding to teach. No miner left behind. Glossed over in the post... just breezed on past like it was nothing .... quoted expecting everyone would understand ... but wth did Aracaliel mean with that string of gibberish? Aracaliel was just asking James for the addie to the minerbumping website, so he could be awakened to the glorious game we call EvE. you know kids get excited and jumble their words sometimes, when they see famous people. I have been following this with avid interest for a few days and I have to say that you are indeed a saviour. Not so much the saviour of hisec per se, but a saviour nonetheless for opening people's eyes and exposing the autism that starts to breed when people take a video game a little too seriously. That people should pay $15 to do some banal things is a choice that is entirely theirs within a sandbox context - inasmuch as it is wholly yours to try and disabuse them of that remarkably stupid notion within the same. I do not think they will understand, nor even try to, but kudos to you for trying to do so any way. Peter Fail is an apt name. For some weird reason only known to him he disapproved of your noble cause and decided he will go after you and close down your bussiness. Well it didn't work out for him and now he is the laughing stock of both his alliance and his friends. 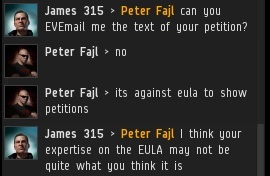 Hahaha the Super-Eleetz PVPer files a petition because evil James 315 prevents him from mining safely in High Sec! Pure gold. 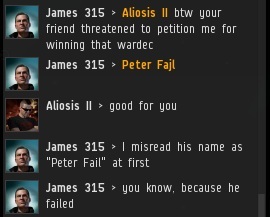 The best part of this is that Peter Fail himself had opened and closed a corp with the same name at least twice before (probably also under wardec), but thinks it's an exploit when James does it ROFLMAO.